Dew Fairy Companion mask is from Gypsy Renaissance's Fabulous Faces collection. 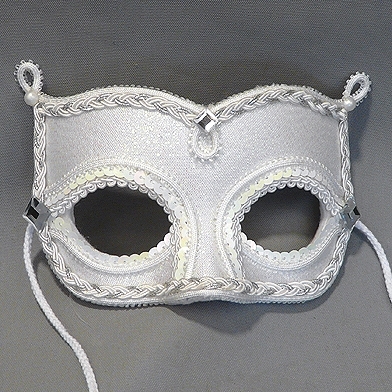 Dew Fairy Companion is a white mask finished with white braiding and crystal rhinestones. Dew Fairy Companion mask is covered with white iridescent lamé fabric and trimmed with white and silver braiding and iridescent sequins. Mask is finished with pearl cabochons and rhinestones.